Product prices and availability are accurate as of 2019-04-15 00:49:33 EDT and are subject to change. Any price and availability information displayed on http://www.amazon.com/ at the time of purchase will apply to the purchase of this product. One NINJA Four Tab Single Serve To Go cup 16oz with lid. Fits all 4 tab standard pro and ultima Blenders that came originally with single serve cups. 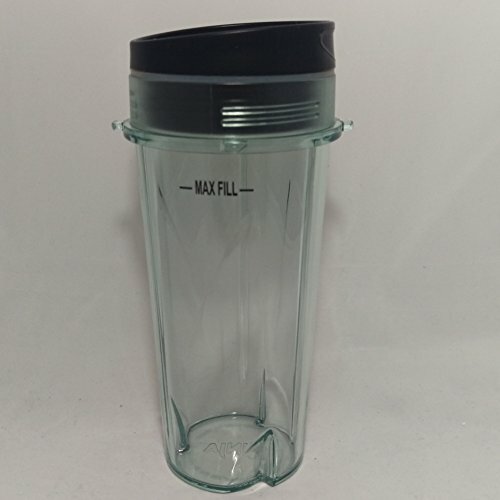 *Does not fit the new auto iQ blender This cup only and is the original Replacement part for the Ninja Ultima Blender Model # BL810, BL820 BL830 and is a clear cup with a slight smoke or gray tint -Also fits Ninja BL770 / BL771 / BL772 | Ninja BL780 BL730 | BL740 BL660 and BL663. Includes Sip n Seal Lid!